Double chin. Turkey neck. 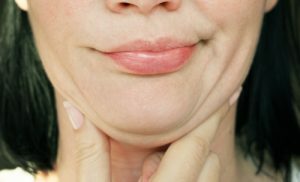 There are many unflattering names for the unwanted fat that develops beneath the chin. This condition brings with it a lack of confidence and a desire to hide your neckline. The presence of this excess skin can derive from a variety of reasons, including weight gain or aging; however, one of the most common reasons comes from genetics. Hereditary traits can often be the most disheartening since genetics are out of your control. Fortunately, many different cosmetic techniques permanently reduce the amount of excess tissue beneath the chin. Two of these techniques are KYBELLA® and liposculpture. KYBELLA® offers a non-surgical correction of a double chin through injections of deoxycholic acid (a naturally occurring molecule in the body). This acid breaks down the excess fat beneath the chin, at which point the fat is absorbed by the body. KYBELLA® is quickly becoming the go-to procedure for the removal of unwanted chin fat. These injections come with no downtime and little pain. Patients generally experience mild bruising, swelling, or numbness that quickly subsides. KYBELLA® permanently destroys fat cells. While results begin to show immediately after the treatment, KYBELLA® injections require multiple sessions to reach the optimal result. Typically, most patients have six treatments spread over several weeks. Similar to liposuction, liposculpture removes unwanted fat deposits from the body via suction. However, unlike liposuction, liposculpture can also sculpt and form the treatment area to its most pleasing contours. Liposculpture can be applied to several regions of the body including the jawline and neck to rid you of the undesirable, confidence-damaging fat tissues. As liposculpture is a surgical procedure instead of an injection, only one treatment is required to reach optimal results. As soon as the swelling and bruising subsides, which generally takes a couple of weeks, long-lasting results will become apparent as long as a healthy lifestyle is maintained. Liposculpture is a surgical procedure. Even though the incisions are small, they are still made, and thus, liposculpture is more invasive than KYBELLA®. Liposculpture does require local anesthesia and discomfort or mild pain during your recovery may require prescribed pain medication. Which Will Be Better for You? Both KYBELLA® and liposculpture will successfully reduce or eradicate the presence of a double chin. During your consultation, Dr. O’Neil will examine the amount of excess skin you have as well as your medical history and medical conditions. It is here that Dr. O’Neil will advise you which procedure may be better suited for you. While some patients may favor surgical or non-surgical treatments, the best option requires that you work with Dr. O’Neil to determine the best route forward. To set up a consultation with Dr. O’Neil, call our Aliso Viejo office at 949-234-7692, our Sherman Oaks office at 818-457-1902, or our Temecula office at 951-296-1690.